For those who love inspirational design ideas for inside and outside their home. Each issue will bring you decorating inspiration for every room in your home from today's top designers. Plus, easy entertaining ideas, breathtaking gardens, amazing floral centerpieces, and so much more! Fill in the form below to subscribe to Flower for almost 65% off. That's one year (6 issues) for only $12.99. What a great deal! 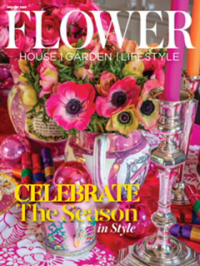 Sign me up for the free FLOWER newsletter!